Any object can be made into a silhouette, but only the most elegant lines and shapes inspire interest. We offer a one-time custom silhouette fee for each custom silhouette we create. All custom silhouettes will be kept on file for future use. There is no limitation as to how we can use the silhouettes. From custom silhouette prints, to personalized silhouette stationery, all our products can be customized with your own silhouette. Before you e-mail us your picture/s please add the ‘one-time’ silhouette fee into your shopping cart along with any other products (such as prints, or personalized stationery) and on the Special Instructions section of the check out write us a note telling us you will be sending your picture/s electronically. When you send your picture, please add your order number on the subject line of your e-mail. All pictures should be e-mailed to orders@lepapierstudio.com. Here are some tips for taking pictures that will set the stage for creating the most elegant silhouettes. What types of pictures should I send? We recommend you sending photos reflecting your everyday style. 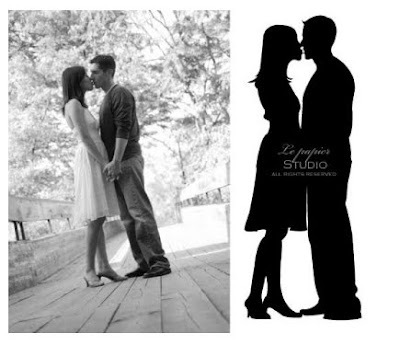 If you are interested in a profile silhouette (for our custom gifts like pillows, paperweights etc) please make sure to stand your subject in profile (facing right or left) and against a well light background (a plain wall will be just fine). Candid pictures are great but we strongly suggest that if long hair (past neckline) you pull it up. We find that ponytails, messy-buns, braids and such make cute silhouettes. If you would like your full body silhouette drawn, we recommend you taking pictures of the subject standing up (in the case of a child or adult) looking straight at the camera or with the back at the camera (these poses work great for our forest silhouette prints). I have a lot of pictures, but don’t know which ones to send…. If you can’t decide which pictures to email or need some help selecting the best ones, please feel free to include extra pictures. We will be happy to look through them and pick the one we feel best describes the subject. How do I determine how many silhouettes to purchase? If you have one child/animal etc, you need to purchase 1 silhouette. For a family of 4 (mom, dad, son, daughter) you would need to purchase 4 silhouettes. Each subject requires it’s own silhouette. The post Custom Silhouettes appeared first on Le Papier Blog. The post appeared first on Le Papier Blog. We welcome Press inquires. For Press Kit or High Resolution Images, please contact us. We’ll be happy to send you a link to our downloadable files. Click here to view our press coverage. The post Press appeared first on Le Papier Blog.